SAID TO CONTAIN: is an artistic research project. We aim to investigate economic phenomena with performative actions in order to make them more understandable for a broader public. For our research we explore manifestations of global trade in our hometowns of Belgrade, Hamburg and Buenos Aires and in Zurich. Tracing the routes of containers filled with goods, tracking the companies behind them and analysing the regulations that make all this possible, we try to get beyond the opaque shell of global capitalism. Our working method is Thinking Public. We think of Thinking Public not only as the act of incorporating ‚the public‘ into our (artistic / activist) practice, but to literally explore the possibilities of thinking in public. We develop performative “Thinking Public Formats” in collaboration with local artists, researchers, and others interested in order to engage a discourse about neo/post-colonialism with a broad public. In our performative settings we aim to materialise abstract theory into graspable bits. At the end of each research episode we present our results in a public lecture performance. A cargo container is our baseline for form and content. Being a visual metaphor for global trade and mirroring it’s opacity, but also serving as an imaginary storage for ideas we play with the concept of a container as a guideline for staging, aesthetic principle and a physical space for presentations. In the Zurich Thinking Public Session at Counter Space we seeked to present the research material of our one year research on global trade in Belgrade, Hamburg, Buenos Aires and Zurich and to put it up for discussion with the audience. We experimented with different performative formats such as live drawings, a national anthem chaos choir, personal story-telling as well as video and audio installations and a slide show. 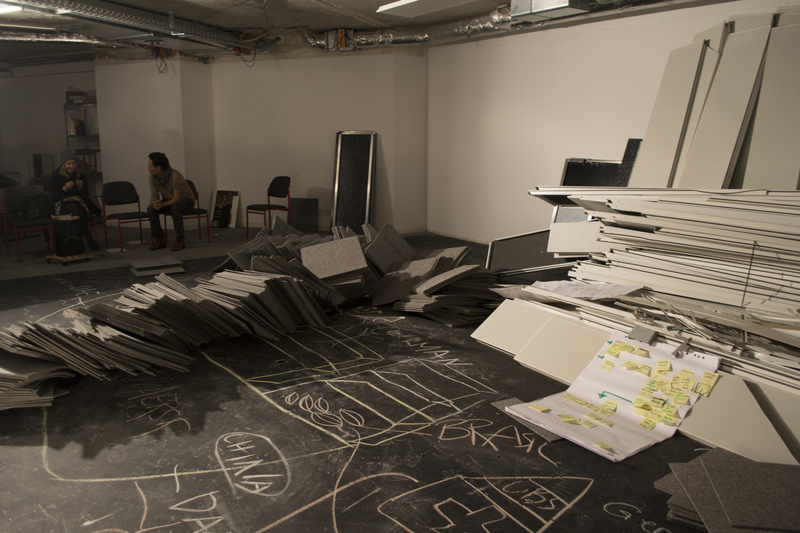 By using performative and artistic methods we aimed to embody and materialize abstract information into graspable bits, inviting the audience to experience other approaches on economic knowledge than purely intellectual ones. During the performance an exchange with the audience was encouraged by different discussion formats. 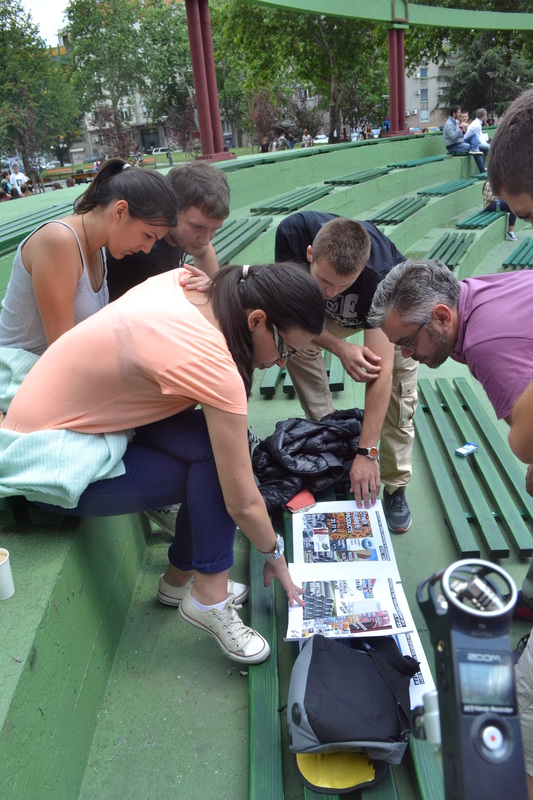 From June 24th to July 5th 2014 we spend a research residency at Magacin Cultural Centre in Belgrade. 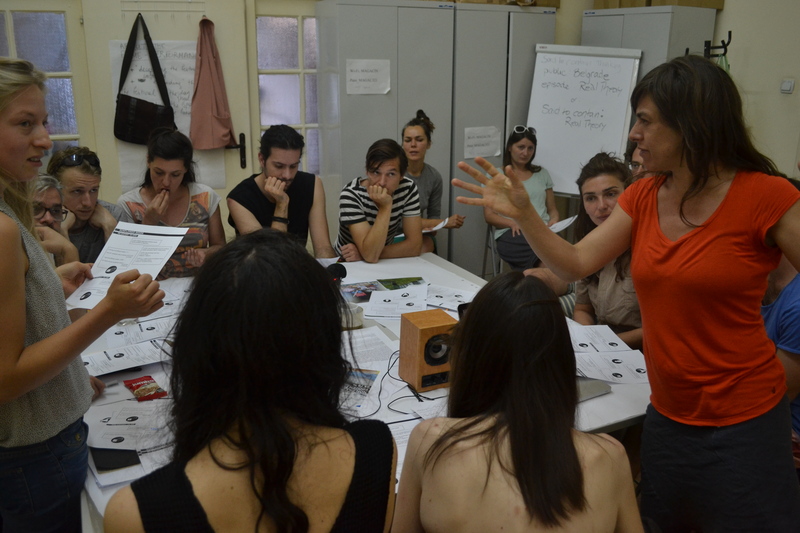 The residency was organised in collaboration with the local art and theory collective TKH-Walking Theory. In our residency we delved into a content-oriented research on one hand, investigating different manifestations of global trade, some concerning Belgrade specifically and some being more general in nature. On the other hand we did a research into how to produce knowledge collectively in performative settings and how to make knowledge available within a public. Below we will shortly present some of our research materials, methods and proposals in order to give a brief overview on our outcome. 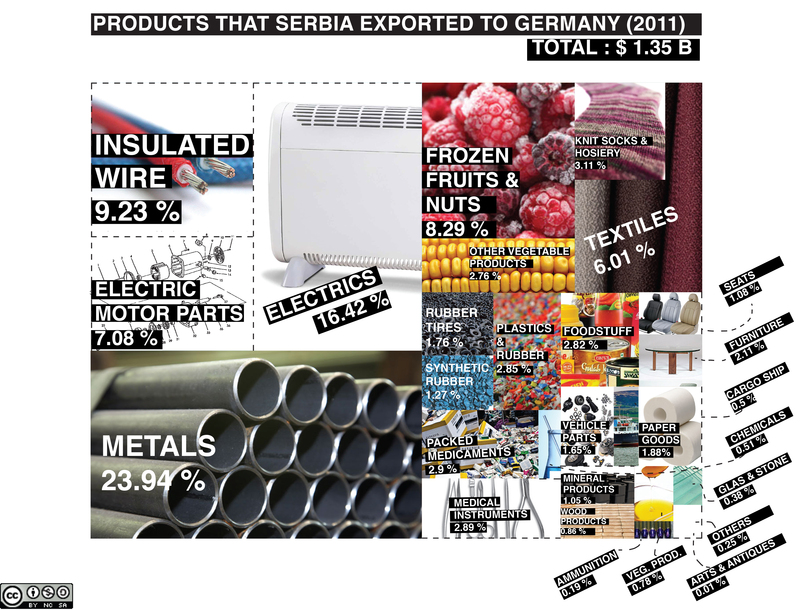 We investigated trade relations between Serbia, Germany, Argentina and Switzerland. In order to materialize abstract data on the flow of goods between these countries we made some visualisations. In the attempt to look behind the opaque mechanisms of global capitalism we prepared a set of questions aiming to engage economics students in a discussion. Using our visualisations as a common ground for discussion and collective thinking we asked them about their interpretation of the data provided and if they were equipped with some tools in order to make a rather professional speculation. At the end of our residency we shared our research process with a public in an open lecture performance. In a round table setting we collectively continued thinking publically.